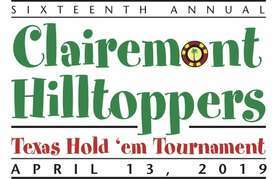 Our 16th annual Hilltoppers Poker Tournament is Saturday, April 13, and promises to again be full of fun and a great night out with our Hilltoppers family. Hosted once again by the fine folks at the Best Western Seven Seas in Hotel Circle, every year we have dozens of Hilltoppers parents, coaches, friends and alumni show up for this evening's entertainment. This is not about a search for the world's greatest poker player, but rather just a fun event with some free appetizers, good music, no-host cocktail service and some great prizes. We start at 5:30 p.m., and if you've never played before (or want a refresher) you can come at 5 p.m. for a quick, easy poker tutorial. We're signing up players now, so you can either download the entry form in the Handout that follows and send it in, or simply contact Ken Cicalo (KenC1313@yahoo.com • 619-889-9216) to put in your reservation and get onto our list. We may take entries at the door, but our space is limited to 80 and those with entries already in are guaranteed a spot. We are also looking for dealers, so if you would like to help out that way, please contact Ken Cicalo above. This is also a way to satisfy volunteer hour requirements for our league. Invite your friends, neighbors and relatives. This is a great group that they wiull enjoy spending the evening with. 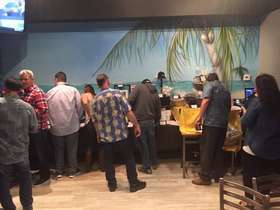 If you've never attended one of our poker nights before, ask around and find someone who has. You'll hear this is tons of fun, and you DO NOT have to be a poker player to have a great time and maybe even win a prize. Get signed up today! OK, let's try this again. After a week's postponement due to weather, we are full go for this Saturday (March 9) to be our Opening Day, with exactly the schedule we had planned for March 2. This means TBall games at 7:45, all players and coaches lined up behind the Padres field at 8:45, ceremonies at 9:00, BBQ, jumpers, raffles, etc. Game schedule is what we had scheduled for March 2, including the one-hour Minors exhibitions. Come early as this is always our biggest celebration day of the year. We are starting at 7:30, with donuts, coffee and breakfast burritos. After our TBall games, our great ceremony at 9:00 willl included raffels for the kids, music, special guests and all of the pageantry of Opening Day at Clairemont Hilltoppers. After the ceremoney, we have a hreat BBQ, sponsored by Islands Restaurant, jumpers for the kids, and ballgames on all three fields the rest of the day. Make it a full day of fun for your family! All games that are shown on your game schedules for March 9 are cancelled. Those TBall and Rookie games will not be made up. Farm, Minors and Intermediate games previously scheduled for March 9 do need to be made up. We are playing the schedule originally shown for March 2 (see below). Once again this year, we will be holding our annual Fundraiser Dinner at Fast Times Restaurant, 3065 Clairemont Dr. (in the remodeled Sprouts shopping center). This year's dinner is from 6-9 p.m. on Saturday, March 16. Every year over 100 Hilltopper parents, coaches, friends and alumni come out for this fun evening of good food, good people, good music and great prizes. With lots of raffles, and silent and live auctions, everyone in attendance has the chance to go home with a prize. This year's dinner will also feature last year's hoit addition – Team Baskets, as all of the teams in our league compete to see whose basket goes for top dollar, winning a team pizza party for the child's ballclub. Raffle and auction items are sure to include dinner certificates, sporting events, household items, sports memorabilia, and some special Hilltopper prizes. All of the proceeds from this evening go straight to our league, so invite your friends, relatives and neighbors. Tickets are on sale now, and will be available at Opening Day on March 2. Space is limited, however, so don't procrastinate. For more information, you can contact Fundraiser Dinner chair Michelle Jennings at 858-336-1595 or dubdub98@yahoo.com. Click on the link below to access schedules for our 2019 season. All T-Ball, Rookie, Farm, Minors and Intermediate schedules are included. Division rules for T-Ball throiugh Minors divisions are also available here. Enjoy the ballgames! If you're looking for a way to show some Hilltopper spirit, or just want a way to combat the chill of a weeknight at Cadman Park, we've got the stuff you need! With Hoodies and Blankets for cool evenings, and T-Shirts and Tank Tops for those warm Saturday afternoons, our Hilltoppers apparel comes in a variety of sizes, styles and colors. Check out the order form in the Handout below, and get your Hilltopper gear ordered today! If you're looking to save a little money on things your child will need for this season, Big 5 has some coupons that can do just that for you. The sporting goods store, located at 4838 Convoy St., is offering 20% off on regular priced gloves, bats, cleats and pants, along with 10% off any sale items. Just print out the coupon in the handout below and bring it in for your savings. If you're looking to save a little money on things your child will need for this season, Charlie Rose has some coupons that can do just that for you. The sporting goods store, located at 9353 Clairemont Mesa Blvd., is offering $10 off a $50 purchase or $20 off a $100 purchase. They will also offer free socks and belts with purchase of baseball pants. Just print out the coupon in the handout below and bring them in for your savings. What an easy way to support Clairemont Hilltoppers! Just click on the Amazon Smile logo, and when you make purchases on Amazon, .5% of your purchase amount is donated back to our league. No higher prices, no extra costs to you. It's a win-win for you and Clairemont Hilltoppers. If you are one of our esteemed returning sponsors and you need the forms to renew for this year, are a first timer, or it's been a while since you have taken advantage of our sponsorship opportunities, the forms are located here for your convenience. Simply download and print the forms and email or mail them in. If you have any questions, please contact Michelle Jennings, our sponsorship coordinator at 858-336-1595 or dubdub98@yahoo.com@pacbell.net. Thank you for 63 years of support to Clairemont Hilltoppers Little League. If you did not attend our Parent Orientation on January 30, you can review the information we presented that evening here. Just click on the "Handout" below, and see all of the slides shown that night, with information on League History & Philosophy, Team Formation, Volunteer Opportunities, and Upcoming Events. Beginning on January 1, 2018, Little League began using a new standard established by USA Baseball, and the previous rules will no longer be the standard for Little League-approved baseball bats. Baseball bats with the new USA Baseball label are available in stores now, for use in 2019, and any bats that were legal prior to 2018 will not be allowed for use in 2019. All of our teams this coming season will have at least one legal "team bat" provided by the league, so no parent should feel obligated to buy their child a new bat, but if your son or daughter is going to have their own bat, you do need to ensure it's legal for use. For more information on the new bat standard, and to know if your bat will be allowed, visit LittleLeague.org/batinfo. Serving The Kids of Clairemont Since 1957! As part of the oldest and largest youth sports organization in history, Clairemont Hilltoppers Little League is proud to offer the finest experience possible for the youth of Clairemont. For 75 years, the name "Little League" has been the most respected and recognized brand in all of youth sports. Now entering our 62nd year, Clairemont Hilltoppers represents that brand as both the longest-running youth organization in Clairemont, and also its only Little League program. Over 20,000 boys and girls have passed through the Hilltoppers program since 1957, and we take special pride in the number of second- and third-generation players in our league. Clairemont Hilltoppers had well over 300 kids playing ball in our Spring 2017 season, and we continue to find new ways to bring fun, safety, competition and life lessons to every child who joins our program. • We offer divisions for kids of every age. 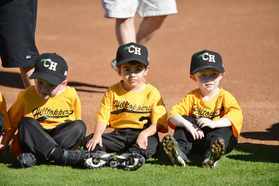 Little League has teams for youth from 4- to 16-years-old. Any child who will be 4-years-old by August 31, 2018 is eligible to start in our T-Ball program. And, while many leagues end when players are 12-14-years-old, Clairemont Hilltoppers offers teenage divisions in the 13-14 & 15-16 age groups in 2018. • Reasonable costs. With many families facing challenging economic times, we have long made a commitment to make playing Little League affordable for everyone who wishes to play. Our registration fee for 2018 is just $68, the lowest of any youth sports league in town. We also ask participation in our fundraiser, selling 50 candy bars or making a $60 buyout. Plus, if you sell 75 candy bars, your registration fee is just $48! If you sell the candy, the fundraiser has a net cost to you of nothing, and you really can place your child in a full season of 20+ Little League games (plus all the associated fun and activities) for a net cost of just $48! • Developing neighborhood and community relationships. With so many families living such busy lives, and sending kids to schools and activities in other parts of town, it's sometimes difficult to even get to know your neighbors. At Clairemont Hilltoppers, though, it's all about Clairemont. All of our players live within the community. We only advertise in our community. Most of our sponsors are in the community. We plan fundraisers within our community. The bonds that develop as kids and parents make friends in their neighborhood often last for a lifetime. • Safety, training and education priorities. Little League has always been the leader in safety, and Clairemont Hilltoppers believes in that model. All of our managers and coaches are taught to make the safety of our children the number one concern. From our leaguewide ASAP Safety Plan, to mandatory background checks for every league volunteer, to continuing training programs for our coaches and umpires, our league will never take shortcuts on keeping our players out of harm's way. Our coaches and umpires are given rules and skills training on a regular basis, and our annual Parent Orientation is designed to make all parents part of the solution, rather than the problem, for our program. • The Little League World Series. Certainly no event in youth sports is more recognized around the world. Each year, ABC and ESPN televise over 70 games in the various Little League All-Star tournaments. Not only is this an exciting summer tradition, but it gives Little League exposure to kids in every part of the country and in dozens of countries around the world. In addition to the World Series for the 11-12-year-old division in Williamsport, championship games in all of the teenage and softball divisions are also televised. Excitement has been high in Southern California recently, as two recent United States Champions (Park View Little League and Eastlake Little League) have come from our area. Every year, Clairemont Hilltoppers places teams in the All-Star tournaments. You can't get to the Little League World Series unless you sign up for Little League! • Great fun activities for our parents. We strive very hard to bring fun beyond just the practices and games... and some of it is for the adults. Every year we have a great fundraiser dinner & auction at a local restaurant , an adult coed softball tournament, a trip to a USD game, a poker tournament, Little League Day at a Padres game, and more. And, we're always looking for new ways to get together for some fun. We know that families have lots of choices when it comes to their kids' activities. If you choose to join us at Clairemont Hilltoppers Little League, please know that we will be doing everything we can to make that the best decision possible! One of the highlights of our 50th Anniversary celebration in 2006 was the formation of a Clairemont Hilltoppers Hall of Fame. Named as Charter Members were 17 individuals whose achievements, contributions and leadership will forever be recognized with this honor. A few others have been added since. A permanent plaque listing the names of all original and subsequent Hall of Famers hangs in our scorebooth building. These members are recognized for their contributions in one or more of these four categories: Inspirational, Leadership, Volunteer and Special Recognition. Future members will be selected by a committee of current and former Hilltoppers. Congratulations to all of these Hall of Famers, and many thanks for all you have meant to Clairemont Hilltoppers Little League. Click on the link below to see our page and become a Fan! Stay connected with Hilltoppers on Facebook!